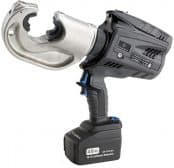 Cembre B1350-CE battery crimping tool is an 18.0V cordless hydraulic crimping tool which can be operated with one hand and is balanced for greater control. 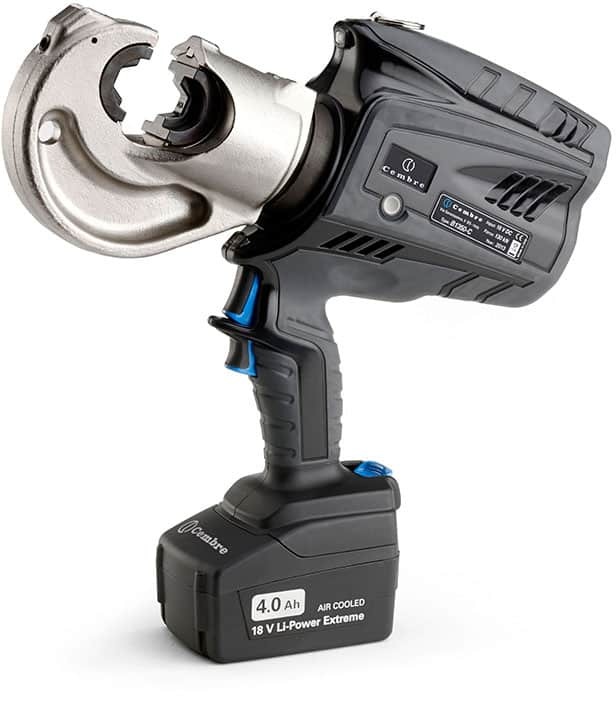 The tool has a greater crimping speed and crimping force as a result from a revitalised hydraulic system with double speed action: a rapid approach of the dies to the connector then a slower more powerful speed for crimping. The Cembre B1350-CE is lightweight and robust due a bi-component plastic moulded body which is highly resistance to damage. The Cembre B1350-CE battery crimping tool is fitted with a maximum pressure sensor and an Li-Ion 18.0V 4.0Ah high power battery and produces minimal noise and vibration. Additionally an OLED display provides operating information data such as the crimping force being generated, battery power remaining, tool identification, LED state, rest, number of operational and service crimping cycles and a tool service to maintain optimum condition. 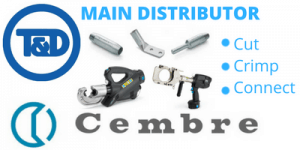 Cembre’s B1350-CE crimping tool can be fitted with all semi-circular slotted crimping dies common to 130kN and are supplied with a spare battery, battery charger, USB cable and plastic carrying case. Cembre crimping tools should be cleaned daily (or after use) with a clean cloth removing any residue in particular particles close to pivots and moveable parts. Every six months it is essential check the oil level in the reservoir. If necessary fill oil level to the top lip and remove any excess air from the reservoir. 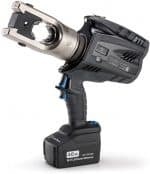 For storage and protection the Cembre B1350-CE tool is supplied in a robust carrying case for storage of the crimping tool. When introducing or changing dies, the battery must first be removed from the battery crimping tool. Note: when more compression is required, proceed according to the sequence and direction indicated in the figure. Ensure that the latch and the upper die holder are fully secured, otherwise damage may occur during tool operation. Grip the B1350-CE tool firmly and comfortably and press operating button to activate the motor pump and advance the lower die. To halt the advancement, release the operating button and the motor will cut out. 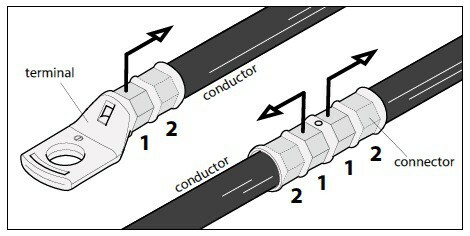 Make sure the Cembre dies are exactly positioned on the desired crimp point otherwise re-open dies and reposition the connector. By keeping the operating button pressed, the motor continues to operate: the ram will gradually move forward until the two dies touch. 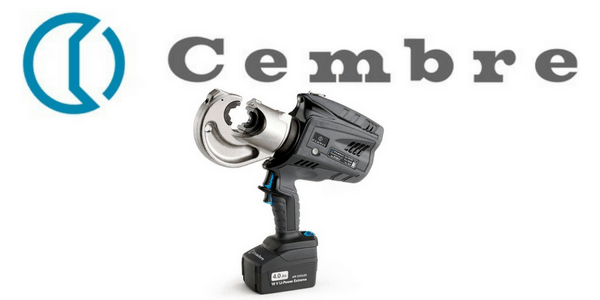 The motor will stop automatically when the set pressure has been reached on the Cembre B1350-CE tool. To display the momentary force or pressure during the work cycle, select the appropriate display from the menu. When the operating button is released before the motor stops automatically, the display will show the peak force (Fp) or the peak pressure (Pp) reached at that instant. To complete the work, press the operating button again until the motor stops automatically; the display will show the maximum force or pressure reached followed by “OK” to confirm correct operation. The display “ERROR”, combined with a beep and the LEDs flashing indicates an incorrect crimping procedure caused by the work cycle being interrupted before the control parameters (force/pressure) of the tool are reached. This error appears when the pressure release button has been operated and the tool has already reached a pressure > 100 bar. In this case, repeat the compression by pressing and holding the operating button until the motor stops automatically. Press the pressure release button, the ram will retract and open the Cembre dies. 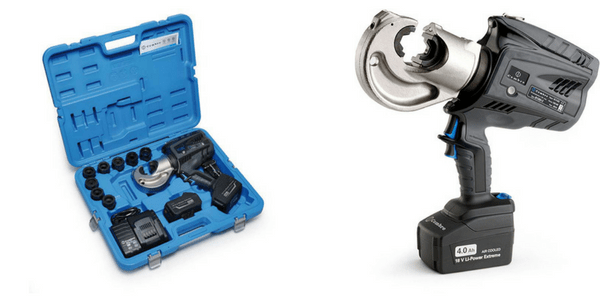 Whilst the tool is in operation, the compression area is illuminated by two high luminosity LED Worklights that switch off automatically at the end of the cycle. For ease of operation the tool head can rotate through 180º, allowing the operator to work in the most comfortable position. Warning: Do not attempt to rotate the crimp tool head when the hydraulic circuit is pressurised. This button is located under the display and allows selection of various screens; it only works when the display is on. Wearing gloves or using other objects may inhibit the operation of the button, therefore use a bare finger to apply only a light touch. The battery is equipped with LED indicators that indicate the remaining battery life at any time by pressing the adjacent button. 1 LED flashing: Minimum charge, replace the battery. With the battery inserted into the tool, the remaining battery life can also be checked on the display, via touch button selection. When the battery voltage has dropped below a minimum safety threshold, the tool will not start, and it is necessary to recharge or replace the battery. The approximate time to fully recharge a battery is about 80 minutes. After each working cycle, and after the extraction of the battery from the tool, an integrated battery cut-off device will operate after 70s approx. Then the LED nearest to button will flash 5 times each 14s approx. The battery will be reactivated when it is reintroduced into the tool and the operating button is pressed. Carefully follow the instructions in the battery charger user manual. 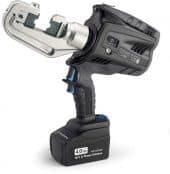 A complete range of die sets are available for crimping all types of cable lugs and connectors for use with the Cembre B1350-CE tool. Contact T&D to discuss crimping cables at MV-HV, including 11kV-33kV, to ensure correct Cembre tool, lug/splice and die set selection. Full range of battery cable cutting tools also available. ➡ See Cable Jointing Tools for a complete range of LV-HV-HV Tools to enable outer sheath removal, insulation removal and screen stripping from power cables operating typically at 11kV, 33kV, 66kV, 132kV and up to 400kV.